Often skin rashes are diagnosed as mange and this needs to be ruled out. Mange is not a disease, it is an infestation of the mange mite which burrows under the skin. It can be very debilitating if left untreated and eventually leads to death. It is not advisable to bring an adult wombat with mange into care as the stress of being in captivity usually results in death within a few days. 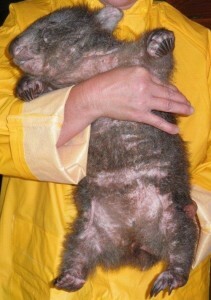 Sometimes a young wombat can be brought into care as they are easier to handle and cope with captivity better. 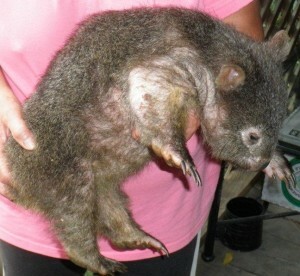 A wombat with mange would need to be quarantined. This means a separate enclosure well away from other wildlife. Unfortunately, young wombats immune systems are sometimes not strong enough to cope with the mange infestation and to euthanize may be the kindest option. Always seek professional help as the sooner treatment is started the better the outcome. 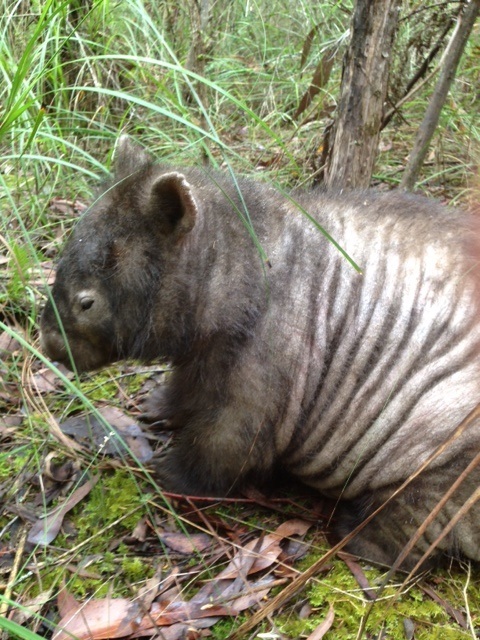 A red rash on the underside of the wombat, excessive scratching along with dry scabby ridges forming around shoulders’ legs, ears and eyes is usually a good indication that mange is present. Joey’s immune systems aren’t as strong as most adult wombats and they succumb to the mange infestation so much quicker. They don’t seem to lose their hair at the same rate as adults but if examined they will have lots of scabbing and skin irritation under the fur. A skin scraping is advised but does not always confirm mange. As mentioned above joeys seem to adapt to captivity and can be treated in care. A joey with mange will be dehydrated so it is essential to offer re hydrating fluids as soon as possible. This will help immensely with the wombats recovery. Same as above but usually the infestation is further advanced by the time they are seen in daylight hours. Often they may appear to be blind and deaf and in the past it has been thought they are beyond help. We now know that the sight and hearing are the first things to return as the wombat recovers. See link below on “How to treat free living adult wombats”. Weekly treatments of Revolution or Cydectin (pour on solution). (Contact Mange Management for dose rate as this can vary between joeys). Treatment should be continued for 6-8weeks with a follow-up skin scraping. If possible all bedding should be disposed of after every treatment. The mange mite can survive off the host animal for up to 3 weeks in ideal conditions, so changing and resting enclosures will help speed up the recovery. Bathing is not recommended in adult wombats as this will be very stressful and cause more harm. In some cases a joey may benefit from a bath in an antiseptic solution eg. Malaseb or Sebolyse medicated foam, Hexawash or like products which may help with the irritation and any infection (bathing is only recommended if the joey is settled and stress free usually after a week or so in care and improvement is evident). Make sure the wombat is thoroughly dried after bathing as mange mites thrive in moist conditions. Seek advice from a professional. There is a simple method of treating mange in “free living wombats” without any need to touch or catch the wombat.